Hi, my name is Drew Lewis (aka MAiJiN), I am a full-time Graphic Artist, Illustrator, and Concept Artist residing in Los Angeles, California. On this website you will see my personal and professional art portfolio work in the fields of illustration, concept art, character logos, graphic design, architectural rendering, portraits, drawing, and much more. contact me if you would like to hire me or outsource me as your artist. I also Blog on the main subject of graphic arts, illustrations, and freelancing which provides free tips & tutorials, new artwork, articles, resources on all subjects ranging from: illustration, storyboarding, concept art, graphic design, branding, social media marketing, business, advertising, and much more. Sign up for free to get my weekly newsletter. Inspired at the young age of 5, Drew developed an appetite for the arts to bring form to his already emerging creativity and budding imagination. He began his journey to capture not only the magic, but the method behind the comics, films, and animation programs which enchanted him as a child. At his local high school, Drew was awarded a scholarship to attend ‘The Ryman Program for Young Artists’ after winning a regional-wide art contest at the age of 16. The weekly program was held at the University of Southern California (U.S.C.) campus within the Fine Art Department by several elite artists. It was through this program where Drew received life changing mentorships from many acclaimed professionals, whom worked closely with him to nurture his gifts and further his understanding of the theories and methods of illustration. Drew was accepted to many of the best art schools in California, however, college was unattainable for him financially. Instead of quitting on his dream of becoming an artist, he adopted a doctrine of self-education, and began schooling himself to enhance his skillset as an illustrator. After a few years of hard work and dedication, he started receiving offers to work on projects in the entertainment and media industry. As he broadened his experience and continued to develop an already impressive portfolio, he was also building a reputation as a serious talent. Drew hopes to continue his journey of breaking past the boundaries of his creative limits, evolve his abilities, and sign onto more exciting projects within the entertainment industry. His greatest ambition is for his work to capture the imagination of his audience, but more importantly, he hopes his art/actions will inspire everyone to pursue their dreams. Always in a dream world; thinking of fantastical and imaginary scenarios. My dreams engineer the most eclectic mixture of subject matter which has influenced my art since i was a child and it was the allure of those images that led to my interest in creating a myriad of imaginary characters, technological wonders, magical scenes, mythological creatures, far off worlds, historical events, or elements of a dystopian future. Theres a fire that has burned in my belly since i can remember; compelling me and daring me to draw out the visions and ideas that blaze through my thoughts. Reopening wounds and bleeding out the creativity that i use to create the images seared onto my consciousness. I believe as humans we are all creative and our greatest feelings when we create, hence CREAT(E)tivity, makes us feel our true power and breathes life into our dreams. Everyday i get to dream and i get paid to create those dreams whilst reminding myself that everyday i am getting closer to the power in my spirit, that power is something that eludes most of us, it is the power to act on a thought and empower a vision without hesitation. That is my greatest inspiration. 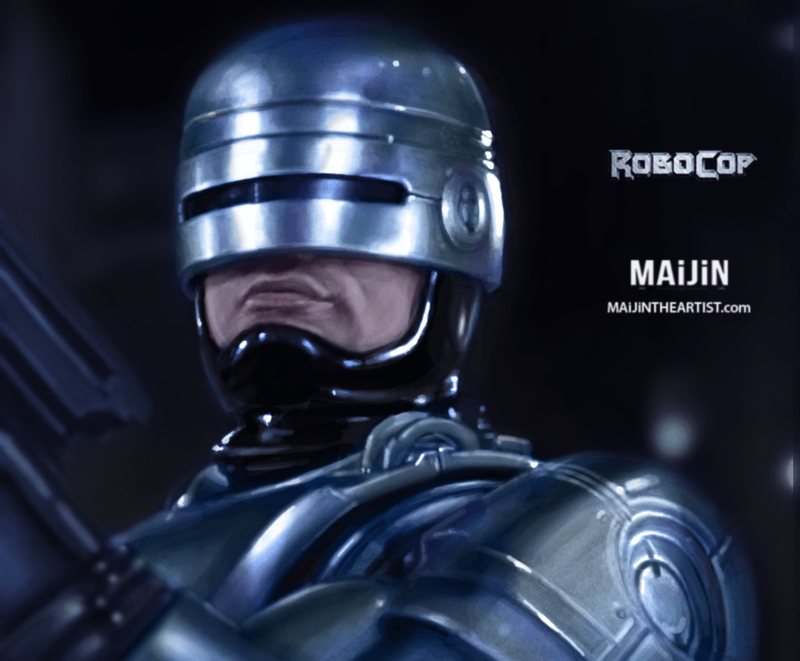 Watch the video of my process of how i created the ROBOCOP painting from a simple pencil drawing to a finished painting in this video demonstration. This video is being shown at 20x normal speed for your convenience to quickly observe the visual transformation all my work undergoes from a simple pencil line drawing to a photo-realism painting! Had the pleasure of being interviewed and featured a while back by this awesome blog who wanted to speak with me about my artwork, background, and journey as a full-time artist. There’s a lot of great information in this audio for professionals or casual listeners alike, also the interviewer prepared some really fun questions about all kinds of things that i think you all shall enjoy. Take a listen.